Cubic Boron nitride, or CBN in short, is synthesized from hexagonal Boron nitride at 50 to 90 kbar and a temperature of 1800 to 2700°C. Grinding wheels with CBN grinding grain are appropriate for use for reinforced machine and high alloy steels of hardness up to 54 HRc, as are for example high speed steel, tool steel or chrome steel, nickel-base alloys, powder metallurgical steels, or white cast iron. Diamonds are primarily used for brittle granular materials as are cemented carbide, ceramics, glass, granite, GFRP, semiconductor materials, or coatings against wear. The hardest natural material in the world – diamond – has also been available in its synthesized form for over 50 years. It is synthetically produced from graphite carbon at pressures from 70 to 120 kbar and temperatures at about 2000°C. Having been under development for over two years, the HI-COMP wheel bodies are up to 75% lighter than comparable steel bodies. 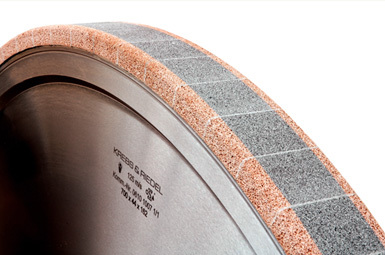 KREBS&RIEDEL presents a new HI-COMP variant for CBN and diamond abrasives. 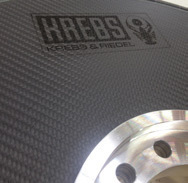 The high proportion of carbon fiber used to form the KREBS HI-COMP wheel hubs guarantees maximum strength with minimum weight. Depending on the process requirement, different sizes are used and this ensures optimal and customized solutions to meet end users’ specific requirements. 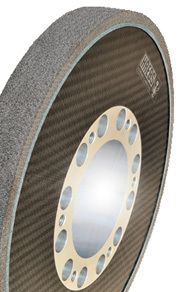 Having been under development for over two years, the HI-COMP wheel bodies are up to 75% lighter than comparable steel bodies. 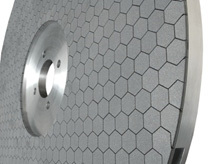 This not only guarantees easy handling for machine set-up personnel during installation but also dramatically decreases the load on the grinding spindle during grinding.